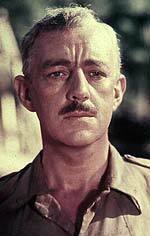 Alec Guinness in Bridge On The River Kwai, a role he probably would’ve preferred that you remember him for. Full disclosure- I’m a lad, now in my thirties, and I kinda do live in a fantasy world of secondhand, childish banalities. But I’m aware of it, and these movies and comics and genre material of various mediums are not my whole world. There’s two things that I can tell you are the absolute keys to healthy living, after having some major tests to my mental health over decades. One is self awareness. The other is balance.These two things added together equal the sense of perspective that leads to healthy living. I watch many of my fellow geeks really struggle with a sense of perspective in their obsessive compulsive tendencies. Being a fan of genre entertainment is much like being a connoisseur of fast food. A steady diet of it is not healthy, and you probably don’t need to spend too much more time contemplating The Walking Dead than you would the McRib. Well, that’s the nail on the head. But we get into things, and we like to know everything we can about them and talk to other enthusiasts about them and compare and contrast, and that’s a beautiful thing. However, this gets really ugly when we inevitably turn hypercritical and start to scratch at ourselves, and tear at things we should probably just embrace, accept, or ignore. An anecdote I often tell- Once I was at a comic shop (Comic Book World, for those familiar with Louisville) and there was a guy -kind of a goober, but he meant no harm- that we’ll call Fanboy Type A. He was very excited about Wrestlemania, which had occurred over the previous weekend. He couldn’t wait to tell us all about the Undertaker’s new look and the way the stage was set when he came out. Apparently it was as if the Gates Of Hell had opened and unleashed a powerful warrior, and it was the greatest thing this guy had ever seen. This showing of enthusiasm did not sit well with a gentleman across the room that we can call Fanboy Type B, and it seemed as if he had absolutely no recourse but to piss on the parade. The indictment came on quickly and furiously. The stage looked fake. Undertaker is fat. He’s too old to be out there. And in the ultimate kick to the downed opponent, his hat looked stupid. Now, keep in mind that nobody asked this guy. Type A blanched, looked at his shoes, and muttered “Well….I thought it was kinda cool…” He had actually allowed the Type B to steal his joy on something as mundane as the validity of a professional wrestler. This sort of thing happens every second of every day on every subject imaginable on the internet, where the effect above is the same, only on a much larger scale. The dissenting voice is always the loudest and the effect is always destructive. The greatest thing about the internet is that it gives just about everyone an equal voice, but the worst thing about the internet is that it gives just about everybody an equal voice. Too many of those thirtysomething lads with their secondhand, banal fantasies aren’t even enjoying them, either because they’ve allowed them to be ruined by malcontents or they are malcontents themselves. I realized that making comics and making babies were kind of the same thing and if I could combine the two, it would be less boring if I set it in a crazy sci-fi fantasy universe and not just have anecdotes about diaper bags … I didn’t want to tell a Star Wars adventure with these noble heroes fighting an empire. These are people on the outskirts of the story who want out of this never-ending galactic war … I’m part of the generation that all we do is complain about the prequels and how they let us down … And if every one of us who complained about how the prequels didn’t live up to our expectations just would make our own sci-fi fantasy, then it would be a much better use of our time.